Touhin! A visual loot monitor similar to XLoot Monitor. I also recommend GreedBeacon for simplifying roll results. Tuck all your loot related spam into another tab and forget about it! 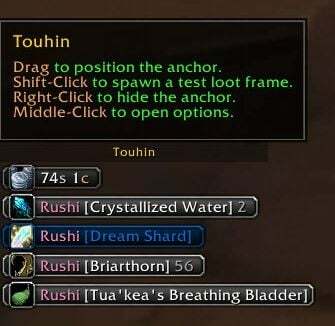 /touhin to toggle the anchor, /touhin config to open the options window. Check http://www.wowace.com/addons/touhin/files/ for the latest! 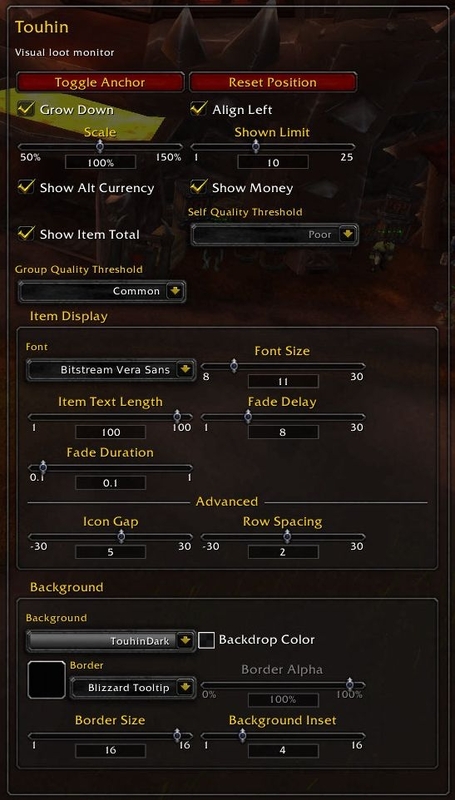 I simply loved this addon, so much better looking that xLoot thingie. Is there any hope that this gets updated to be LEgion compatible? thank you for this, i really like it. What about adding ButtonFacade support? I would give the icons a even more polished look. I hadn't planned on adding support for BF, but I'll look into it. I think it seems a bit over-the-top, though, and could look a bit awkward as the row border and the icon border would be at odds. Hey, thank you very much, I like this a lot. I hate it when the loot spamms my (small) chat, and this is a very cool option for those like me.